Telenor introduces an amazing balance load offer for its valued customers. Now customers can re-charge his/her account for using internet service. In this tenure the usage of internet is increasing very promptly and there is countless cellular operators use internet facility through cellular phones. This telecommunication always launches feature as per customer wishes and finally it has created an exceptional Telenor internet easy load offer for all its valued prepaid subscribers of Pakistan. This feature has introduced for prepaid Talkshawk and Djuice subscribers of this telecommunication and they can easily avail fastest 2G and 3G internet service by using Internet Easy load offer of Telenor. This telecommunication is first one who has launched this facility for its consumers and others telecommunications are not able to produce this kind of facility of its subscribers till yet. This feature has generated for internet lovers of Pakistan from now they can easily avail speedy internet service from re-charging internet balance load. This is good news for all the internet users of this network now they can online on his/her Facebook account at every time in a day. They can easily share his/her status on Facebook, tweet on Twitter and many others things. Customers can avail all internet facilities after re-charging account. Smartphone operators are able to use multiple mobile applications by using it without facing any issue. In this modern era Smartphone users also want to online every time on various mobile apps like WhatsAPP, Viber, Instagram and Hangout so all these types of cellular operators can easily use application after re-charging Telenor internet easy load. This facility is available all over in Pakistan and customers can easily enjoy an exceptional service after re-loading his/her account. Now your net service in your pocket every time and you can easily enjoy fastest internet facility by using this feature. The first priority of this network to serve a reliable telecom service of its valued customers and it launches quality facility for consumers with smart incentives. This is also a remarkable service has launched from this network side for its prepaid customers. There are largest cellular operators who rely on internet to do multiple works so they can easily check official Emails, Conference calls and view official online sheets by using this internet load offer. This is an exciting feature has created for all internet lovers or users of Pakistan and this is an amazing news for subscribers of this telecommunication who already connected with this network. 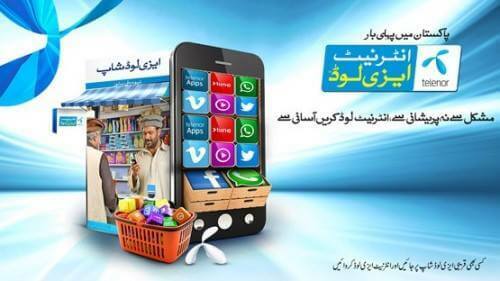 Users can charge internet load balance from nearest franchise or retailer shops of Telenor. Users request to retailer shop keeper to recharge internet recharge balance to use. This is simple procedure like normal easy recharging option. Customers can check remaining balance by dialing *200#. Customers can avail 1 MB internet data in just RS 1.00. This facility is available for prepaid customers. Loan amount will not deduct from Internet easy load offer. Customers can also subscribe other Telenor internet packages with this feature. This telecommunication reserves right to change charges of this service at anytime without informing of consumers.